For this huppah – a sort of sacred canopy under which the bride and groom are married in the Jewish tradition – the bride wanted themes of cotton, lace, lavender and gold for her Provence / South Carolina wedding. She supplied bits of lace, embroidery, and doilies from her family to incorporate. The rest was up to me. 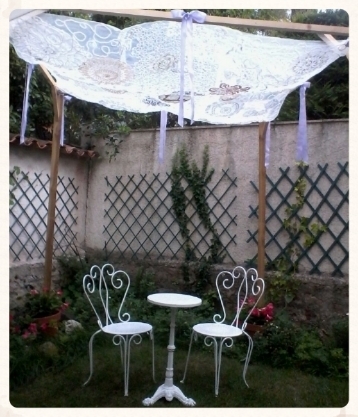 Sourcing fabric from the internet and local brocantes (kind of like a French garage sale, except it includes many people selling their wares together, on a public street or plaza) provided me with further antique lace and macrame doilies. Many a discreet eyebrow was raised as I hand embroidered the lavender blossoms or the Hebrew symbol for “Life” on the train on my way to my other job, but the French are discreet. Not once did anyone ask or comment. Finding the way to bring all the elements together proved a tricky task, especially as the piece had to be 2m x 2m – HUGE! In the end, I broke it down into 3 panels, hand embroidering fluffy cotton yarn into arabesques on the 2 side panels, the golden “Life” symbol at the center, framed by hand embroidered flowers from the bride’s grandma. 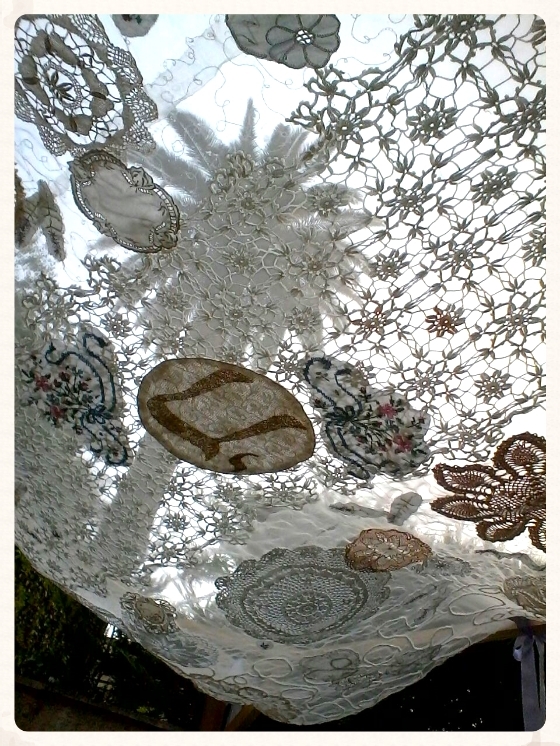 The yarn, doilies, and lace flow in and out between layers of transparent cream gauze. Free-motion sewing through all layers repeats the yarn arabesque pattern and holds everything together. The end was not only a work of art, but a work of love, to be cherished and handed down through hopefully many generations. Antique / vintage cotton & silk lace doilies, cotton yarn, metallic gold sewing and embroidery thread, cotton embroidery thread, satin material and ribbon, polyester gauze.